With fall leaves comes fall fashions and... wait. What? Yeah.... my fall wishlist, y'all, parts one and two. Part one has items that need replaced. As I am finding my style, there are pieces I reach for again and again. Yay! But eventually, they can wear out. Boo- so they need replaced. Add to that the fact that I, y'know, pushed out a small human and, well, my body has changed somewhat, in ways you don't even really think about till trying to dress yourself as a new mama. I'm curvier and my actual rib cage expanded (Here's a TIL for you all: all your organs get pushed up to the rib cage for several months of pregnancy). 1. Tweed Blazer- I had one from H&M for years and it was still in beautiful shape, but post-baby, that shape was not, um, my shape (hello, curvier body). So, it got sold on Poshmark, and is now being loved by a new owner. I however, am not ready to give up the tweed look, so a replacement it is! 2. White Button Down- I'm soooo curious to try out Elizabeth & Clarke's unstainable version of this. Have you tried them out? 3. Black Pants- I wore black pants at least once a week when working. Now that I'm no longer going into work, I suppose they aren't necessary, but even if I'm just chillaxing (is that word dating myself? Oh, well!) at home with Ellis, they can still form the base of a great outfit! 6. Glasses- I've had my glasses for longer than I've been married. They feel pretty iconic to my style (they were even part of my logo before the blog re-design!) But the wear and tear is undeniable. Feel free to send me links to pretty glasses frames, y'all. 7. Minnetonka Moccasins- I wore these almost everyday this summer, but they are great fall and spring shoes too! This current pair I've had for a few years, so the fact they are coming apart at the seams isn't too surprising. Also, unsurprising? That a new pair of the same version of these need to get into my closet ASAP. 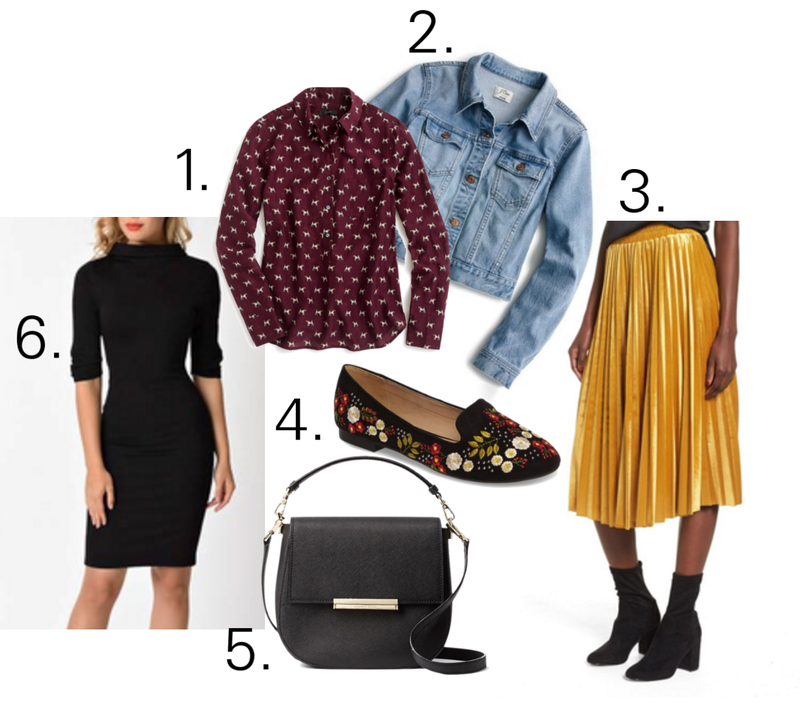 Part two of this list are items I don't have but that I need (or want, I'll be honest) in my wardrobe. 1. Fox Terrier Print Pull-Over- This one is a total want, not need, but- FOX TERRIERS. I own a fox terrier, and feel this should be explanation enough. But even if you aren't a total dog lover, how can any resist the cute print and rich burgundy color? 2. Jean Jacket- I have winter coats, and I have three-sizes-too-big windbreaker coats, but not really very fashionable lighter weather coats. 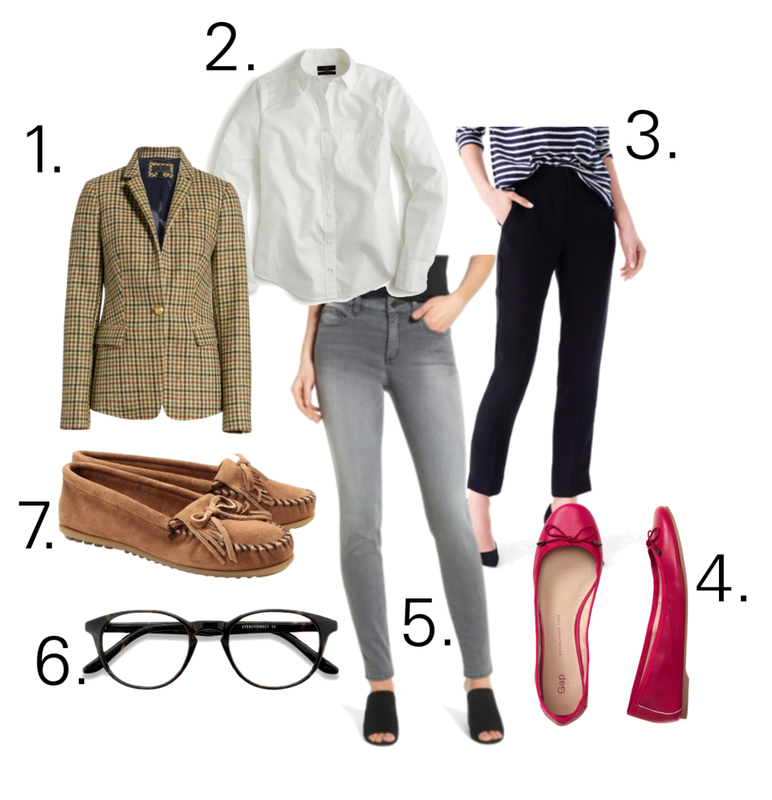 A Jean Jacket would fill that need and its casual tone is great for my everyday life. 3. Pleated Skirt- A tip to gather a sense of what you like, sartorially, is to have a Pinterest board where you pin outfits you like. Its how I first started to consolidate my style years ago. When looking over mine recently, I noticed a pattern- pleated skirts kept getting pinned. This gold baby is actually already mine- I got it as my first purchase via Poshmark. They have several other really cute pleated skirts there too. 4. Embroidered Smoking Slipper- Embroidery has been a big trend this summer, and it still going strong heading into fall. But I hadn't really fallen for any of it till this. Is it the most practical shoe ever? Well.... it's not impractical, precisely. Right? Right? And anyway, it is pretty and at forty-five dollars is not bad for a shoe. 5. Kate Spade Bag- I've used clutches the past few years, when I've needed a purse, but you know what they say, first comes love, then marriage and then.... a baby carriage. And all of baby's things that need hauling around. (And a baby, of course.) Ellis has a diaper bag, of course, but sometimes that's huge to haul around, so a purse is nice. Since a nice purse is a.... pricer purchase, and something ath will get used everyday, I've been putting some research into it. Keep your eyes peeled for more on that soon. 6. Dress-Thanks for Nicole's Feel Good; Dress Better, I've did a closet clean out and noticed that I don't really have much in the way of dresses; I've preferred skirts. But there is something very nice about just throwing on a skirt and being done with an entire outfit. This dress is a bit of a different silhouette than I usually go for, but have been wanting to experiment a bit. What do you think? I really like the tweed jacket and pleated skirt!